"Mr. Farr described pulling the 8600 out of a storage shed where the temperature had reached -13F. He let it warm up, and after it booted perfectly, he was amazed at its speed in the GUI. "And it was so ridiculously fast. I mean, I could sell tickets or something. ('See? See?? Want to close a window? WHAM! Hit the pull down menu? WHAM!')'" "My poor client . . . you have to picture this: she has a brand new MacBook, but she's been designing and printing all the labels for her line of herbal products on an ancient Performa  using ClarisWorks. Urk! Obviously this is okay, even if it has me rolling my eyes, so long as the old Mac works. She also just hired a new assistant, and she wants to keep the assistant out of her office space, and she doesn't want to let the assistant use the MacBook. This means she'd like the assistant to take over label-making duty on the (ugh) Performa. And of course, when we last looked in on this scene, I couldn't even get the Performa to boot. "Well, my first brilliant idea was to just sell her my old Power Mac 8600 and toss the Performa. What a perfect solution! But first I had to go extract the 8600 and one of three monitors sitting in the storage unit, gather up all my old SCSI gear and OS 9 software, set the whole mess up on the dining room table, and erase all my personal data. Whew. (Pant, pant...) "
"Introducing the notMac Challenge to create a free replacement to dotMac's client-based services that's easy enough for a first-time Mac user to install and so fully and transparently integrated that a long-time dotMac user wouldn't notice the difference. "Contribute to the prize and help provide incentive for someone to solve this problem. "Since Apple decided to start charging for dotMac, I've spent $495 to keep some useful files remotely accessible on my iDisk and sync my bookmarks, address book and calendar between computers. While I find these features incredibly useful and convenient, I have no need for any of dotMac's web-based services, and as a result, I don't think I've been getting a good value from Apple. I know that workarounds exist that allow one to take advantage of dotMac's services without a dotMac account, but they require a level of technical proficiency that I just don't have. I've no doubt there are a lot of people like me. "The goal of the notMac Challenge is to create the incentive for someone to make an alternative dotMac solution available for the general public. Since this is something that could benefit a large number of people in the Mac community, I figure what better way to create that incentive than to invite anyone interested to contribute to the reward. "To make the stakes even richer, I'll match every contribution up to a total of $10,000. So, if you contribute $100, I'll double it for a total of $200. Hopefully, in a short amount of time, the prize pool will be large enough to encourage someone out there to liberate the less technically literate of us from the obligation to pay Apple $99 a year." PR: ThriftMac, in conjunction with XtraLean Software, is offering a free copy of ShutterBug to the person who comes up with the best name for the ThriftMac mascot. Contest entrants will also receive a coupon for $10 off ShutterBug just for participating (regular price is $39.95). The contest will run from December 8 through December 31, 2006 and the winner will be announced a week thereafter. Participants can submit their entry via a form at the ThriftMac website. To submit an entry and for contest details, visit ThriftMac. ThriftMac is a website devoted to cool freeware offering a collection of the "cream of the crop" in free applications for Mac OS X. The ThriftMac mascot is a friendly green worm that resides at the bottom of the ThriftMac website, inviting visitors to download the freeware of their choice from the great collection of free apps available at the site. This worm needs a name and is looking to choose from the submissions sent in by contest participants. Contest entries are being accepted until December 31, 2006. The winner will be decided by a panel of judges consisting of ThriftMac and XtraLean staff. ShutterBug is an easy to use, powerful website creation tool for Mac OS X that lets you create all different types of websites, from elegant online galleries and slideshows to full-featured websites. It offers WYSIWYG tools for quick and easy content building and for creating stylish website designs. ShutterBug comes packed with more than two-dozen themes and offers 80 more themes available from shutterbugland.com for free download by registered ShutterBugs. Name the Worm, Win a Bug! "Some Intel-based Macs can become unresponsive while being used as a host in FireWire target disk mode. This may occur if the second computer is left connected for over 24 consecutive hours to the Intel-based target Mac. "To avoid this behavior, unmount the host computer and restart it with a new target disk mode session every 24 hours." PR: Expand your storage capacity and port flexibility while decreasing your desk/cord clutter. The Newer Technology miniStack V2 is the perfect external drive and bus powered hub companion for any computer. Housed within the miniStack's compact, sleek, state-of-the-art enclosure is a fast 3.5" drive with up to 750 GB that blows away smaller and slower 2.5" internal drives. Now you can have all the storage space you need for music & video files, graphics & photos, and document backup. Plus, with 2 FireWire and 3 USB 2.0 ports built in, you now can connect devices including scanners, printers, memory card readers, digital cameras, and iPods - all at once! 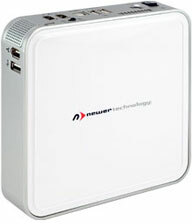 This terrific storage/connectivity solution is fully portable and works with all Macintosh computers and laptops, as well as virtually any Windows or Linux-based system with USB or FireWire. The easy-to-use, Plug-and-Play miniStack also is perfect for booting your OS on any system with USB 2.0 boot-support. Whether you're a techie and want to add your own hard drive to one of our 0 GB Kits or want the convenience of a preconfigured solution that comes complete with a leading hard drive utility/performance & backup software bundle valued at $200, NewerTech has a miniStack solution for your specific need. High Performance 3.5" ATA/6 7200 rpm Drive with 2 MB, 8 MB, or 16 MB data buffer, Premier Top Tier Oxford 911+ Chipset, Smart Power Auto-engage ON/OFF, Intelligent Thermal Control, 3 Additional FireWire Ports, 4 Added USB 2.0 High Speed Ports, Full 2 Year Warranty. PR: Now you can transfer or download data from your flash memory card to your computer with the PROGear-G5. PR: Ear3 is a miniature, personal hearing threat detector that can immediately signal the user when a sound source exceeds safe listening levels. Ear3 can be used with iPods, MP3 players, boom boxes, stereo systems, automobile audio systems, rock concerts, discos, orchestras and other sound sources. When used properly, Ear3 can dramatically reduce opportunities for sound induced hearing trauma. Ear3 is approximately the size of an iPod and does not require any electrical connections to the sound source for its operation. Ear3 uses calibrated electronics to measure sound pressure levels and signal those levels to the user in four easy to understand steps. When sound pressures are between 70 to 84 decibels (dBA), a green light illuminates. At 85 decibels the light flashes red/green, indicating entry to the danger zone for hearing damage. At 90 decibels a steady red indicator light comes on indicating high danger to hearing. 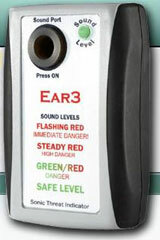 At 100 decibels and above, the red indicator light flashes rapidly on/off, indicating extreme danger to hearing. Ear3 adds an important element of reality and a protective option to a person's sound level choices. Ear3 also provides a sound chamber that approximates the size of the human ear canal in order to increase accurate assessment of sound pressures at the eardrum when ear buds are being used. This feature models the volume of the ear canal and takes into account sound pressure increases introduced by resonance characteristics of the canal. By incorporating resonance factors into Ear3's design, users receive an improved estimate of sound pressure levels actually being presented to the ears. For example, a given sound pressure measured from ear buds in a free sound field can be 10 to 15 decibels lower than the same sound pressure delivered directly into an ear canal. With iPods, for example, Ear3 can monitor sound levels at the ear buds and can be used to adjust these signals to safe levels. iPod users can rapidly and easily adjust output for safe listening levels. There is no need to guess at sound levels being presented to the ears. Ear3 provides factual information that can guide listening levels selected by users of music players. The iPod's new Volume Limit function (accessed via the Settings menu) now provides the user with an opportunity to read the output level of the iPod with Ear3 and then set the Volume limit to a specific safe level. The iPod will remember the setting and will use it in future playbacks. Parents can set the Volume Limit and can then lock the settings so children cannot operate the unit beyond safe levels. In sound fields, such as those broadcast from in-home stereo systems or automobile stereos, Ear3 can be used to read the strength of sounds and to guide adjustments to safe levels. 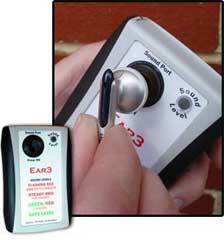 Regular use of Ear3 will reduce the probability of hearing loss from loud sound sources. In addition, users are likely to remember the volume settings they use and will then guide their future settings based on this information. In noisy environments where the user cannot directly control sound output, such as rock concerts, discos or other locations, Ear3 can remind the user to protect his/her hearing. Small, foam earplugs can attenuate loud sounds and limit the risk of hearing damage. Ear3 was developed at the Hollins Communications Research Institute in Roanoke, Virginia, a nonprofit organization that has developed innovative approaches to the behavioral treatment of stuttering and a new, advanced executive hearing assistance program. The Institute can be reached by email: admin@stuttering.org.